The Gold Coast Rapid Transit (GCRT) is a major infrastructure project that aims to integrate new and existing transport systems, support urban regeneration and facilitate sustainable transit-oriented development. The GCRT Project comprises a 13km light rail system between the Gold Coast University Hospital on Parklands Drive in Southport and the Broadbeach South Station adjacent to Pacific Fair Shopping Centre. The Project brings together the world’s best infrastructure and urban design solutions to create a vibrant and bold future for the City. Cardno’s involvement with the GCRT Project has been to provide consulting services in regard to underground utilities, landscape architecture and urban design, building structures, building services, building certification, way finding and temporary traffic management planning. The major 12d task undertaken by Cardno on the GCRT Project was the assessment of existing underground utilities and space-proofing of proposed and relocated utilities. Accurate underground utilities records are rare. Records are usually incorrect, incomplete, or inadequate. Cardno was faced with the challenge of coordinating a variety of survey data, identify existing utilities that clash with the proposed track alignment, and provide design solutions for the protection or relocation of these utilities. This included allocation of corridors for utility owners to commence detailed design. Incoming field data was assessed and re-modelled where accuracy was lacking. The field survey data was received in strings & points format. Cardno designers converted these raw strings into 3d pipe & conduit super strings. Where field data was not provided, gaps were interpolated or extrapolated to provide a completed model. Existing underground manholes and pits are traditionally surveyed with a point to represent the structure. 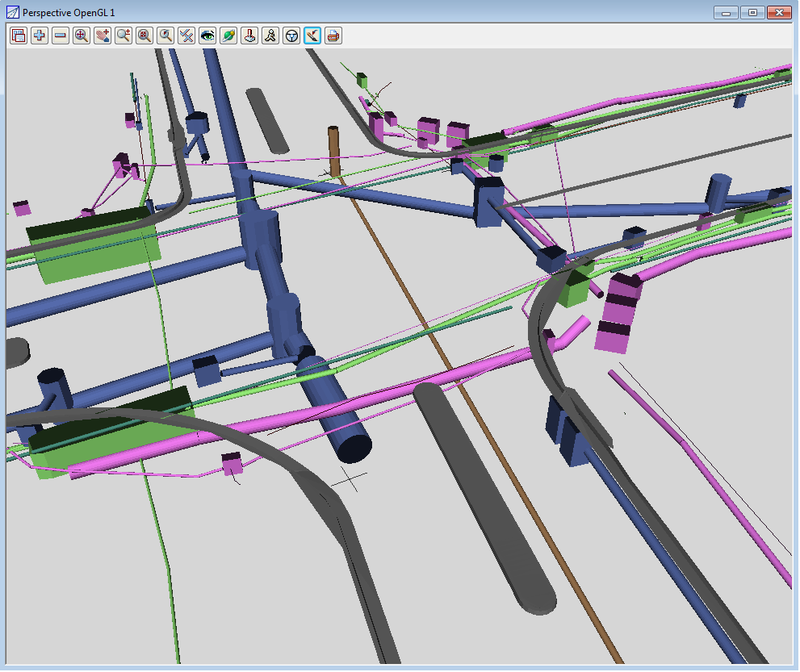 To provide a complete existing model, manhole extents and pits sizes were also surveyed and then accurately modelled. By utilising the developed 12d model, clashes with the track alignment were easily identified which enabled the Cardno team to allocate corridors for the various utility owners. The result is an interactive 12d model containing the proposed track, all known services and proposed service corridors along the construction route.